The following is a guest post by Ty Strong. Ty noticed a curious lack of information on the <time> element here on CSS-Tricks and I agreed. Can't let that happen! Take it away Ty. The <time> element in HTML represents a machine-readable date, time, or duration. It can be useful for creating event scheduling, archiving, and other time-based functions. WordPress uses the time element in the default theme. Reddit uses the time element as well. Reddit using the <time> element for posting dates. The time element has had a rocky road. It was added to the HTML5 specs back in 2009. Two years later in 2011, the spec was dropped and replaced with a much broader element, <data>. Later that year the time element was added back with some revamped features. Rest assured, you can use it! Bruce Lawson covers the situation well: gone, back, now. A classic "paving the cowpaths" moment in HTML history. The text in there happens to be a valid datetime attribute value (more on that in a moment). But it doesn't have to be. You could move that text into a datetime attribute and use different text. The datetime attribute is what makes the time element unique. It represents the date, time, or duration for whatever text you are representing in a machine readable format. That means it is for computers, not humans, so it has very specific formats. There are a variety of standard ways to format the datetime attribute. Very Simple. Year before month. Year, month, and then day. Hour, minute, then seconds. Seconds is optional. Fractions of a second can be represented up to three digits. Combination of Date and Time, separated by a capital T. The capital "T" can be replaced with a space. Starts with plus or minus sign. Colon (:) is optional. +00:00, or UTC time, can be represented by the capital letter "Z". This is the same as Date and Time with an added time-zone offset. Again, "T" can be replaced with a space. Year followed by a capital "W" with the corresponding number week. This must be four digits or more, so `0001` and `12345` both work. Capital "P", an optional day value, capital "T", then optional values of hours, minutes, and seconds. All letters must be upper-case. Week (w), Day (d), Hour (h), Minute (m), and Seconds (s). Letter can be upper-case or lower-case. Spaces are optional. Having Trouble Formatting the Datetime? Using this little tool you can input a certain date or time (or both), and it will output the correct datetime value. 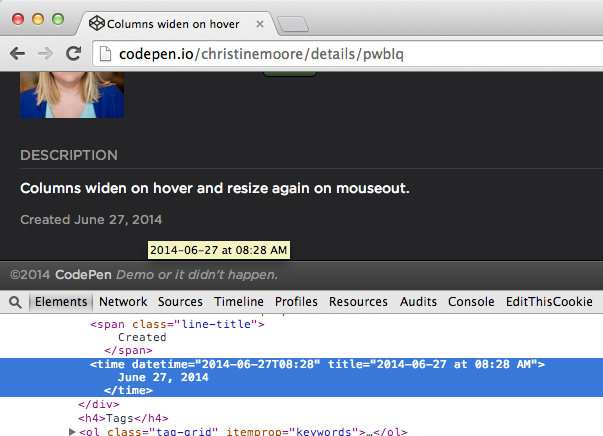 See the Pen Datetime Creator Tool by Chris Coyier (@chriscoyier) on CodePen. Browser support isn't a major concern with the time element. If a browser is familiar with it, great, if not, it will treat it as a generic inline element which is perfectly fine. The datetime attribute is also perfectly accessible. There is a DOM interface associated with the time element though. Specifically dateTime should be available on a reference to that element. What is the benefit to using <time>? The uses of unambiguous dates in web pages aren’t hard to imagine. A browser could offer to add events to a user’s calendar. A Thai-localised browser could offer to transform Gregorian dates into Thai Buddhist era dates. A Japanese browser could localise <time>16:00</time> to "16:00時". Content aggregators can produce visual timelines of events. Search engines can produce smarter search results. For example, in the recent heavy snow in the UK, I searched for school closures in my town and discovered my kids’ school was closed. After receiving a phone call from the school asking me where my kids were, I re-examined the webpage. In small print at the bottom of the page were the words "Published 5 January 2008". I expect that operators of search engines would rank more current pages more highly on searches connected with current events. Are you using <time> on any of your projects? 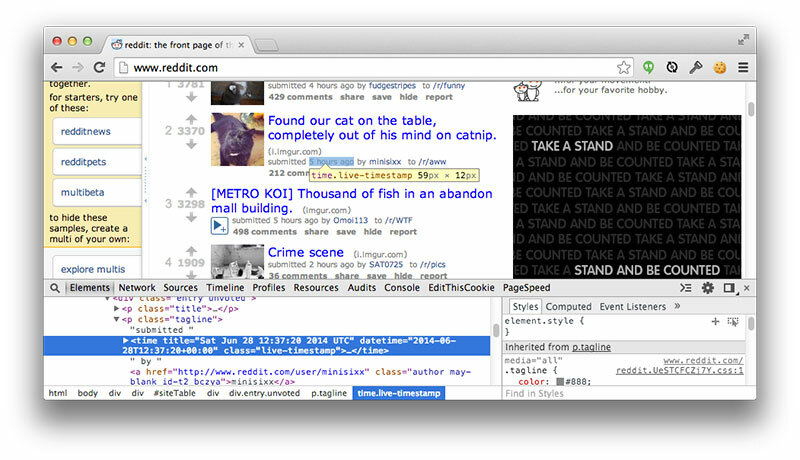 its a nice native component, but its avaible for Chrome only, in firefox is not suported. Not sure where you’re seeing this but according to caniuse it’s compatible with every major browser (if you’re not counting ie8). Interestingly enough, MDN seems to think that it is not supported in Chrome. I’ve updated MDN article according to caniuse, just waiting for review. Would I use it with relative times? If so, a complete date should be on the attribute I guess. Yes, you can use it with most relative times. For the time of day, you can simply leave out the time-zone offset. For dates, you can choose broader spans such as a certain week, a month, or year. The exceptions are specifying something such as “Sometime in the 18th century”. Thanks for clearing it up, Ty. The time element is hard to track down information on because it’s changed status so much. Bad value 2013-09-31 for attribute datetime on element time: Day out of range. I’m not sure what ‘range’ it’s looking for, but a quick Google searches turned up nothing. Aug 31st, 2013 is not the same as 2013-09-31. 2013-09-31 is September 31st, 2013, which doesn’t exist. YEAR-MONTH-DATE is the correct format. There isn’t a 2013-09-31, only a 2013-09-30. Ha! Mathis is totally correct. There is no August 31, 2013! So much for putting random dates on pages. There is an August 31st. There’s no September 31st, though. Nice explanation! We used the time element on our redesign of TechCrunch. Very informative. It’s not easy to collect all these info together with the goal of this (rather uncommon) element. I’ve used it sometimes, but I mainly develop web applications that aren’t indexed by search engines, so its role is weak. For me the worst part is that IE8 and lower can’t stylize it without the old html5-shiv trick. So watch out. Nice explanation! I’ve been using time for all post date in WordPress websites and I use PHP to output datetime attribute like this the_time( 'c' ). So, question is, why another tag and not just a class? Technically, you could use <div> tags for paragraphs, bold text, list items, and buttons. Although you can do it, there are better, more specific tags that you could use. Part of the reason for bringing back the time tag and not using the generic data tag was to have a more specific tag just for dates, time, and durations. I hope that helped! I have to admit, I’m not really aware of the use of the “ element, so thank you to have written this post ! I hope it will make people understand better the use of this element, as it does for me ! Excelent post Ty. Do you have any other advise for using it correctly for Seo practices? Is there something more to have in mind or this is the all recipe? I love the idea of using the <time> to improve search results for time sensitive queries (e.g. weather updates, sport updates, disaster updates, etc. ), but I can see this going south real fast. What’s to stop someone from putting a small script on their page that outputs the current date and time every time the page is loaded? For accessibility and semantics? This element is wonderful. For SEO? Hopefully someday, but right now it’s sadly just not ready for the prime time. I have a question, how would you do if you want to display something like: 2 days ago ? Use a time-Element only, if you have a concrete date, time or duration. Otherwise don’t use a time-Element. @Mathias, although at the same time the <time> element can add a concrete date, time or duration to something as vague as 2 days ago. Yes, its true. But it is only possible if you know this particular date. Example: If you want to participate in the tests, you must log in first 2 days in advance. @James thank you for you comment on that. @Mathias that’s a very good point. What about the pubdate attribute? The attribute pubdate has been dismissed from both the WHATWG and W3C specs. Back in 2011 when the time element made it’s reappearance, pubdate did not come back with it. Thanks Ty for clearing that up. I assumed that was the case. <time> tag indeed is an important tag which a lot of us can easily overlook. Thanks for the article. I’m sure a lot of us would remember to use the time tag henceforth.